A chain is a set of stitches or links connected between them to allow the transmission of a movement. Chainsor channels : silver chains massif 925, silver chains rhodié, Chains stuck in gold, golden chains. A chain can consist of different stitches, The main names are: mesh convict, meshes convict filed, mesh jaseron, meshes curb chain(chain bracelet), meshes barber, meshes ball, meshes horse, meshes snake, Venetian stitch, etc. 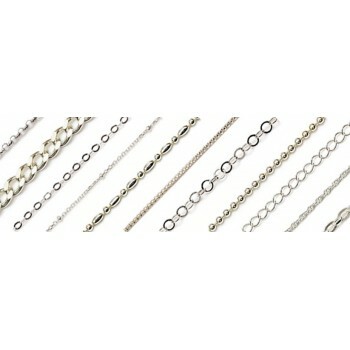 Our 925 silver chains are perfect to create nice and resistant necklaces, and are available in different styles. Sign up and receive news, our tips, tricks and bargains. © France Perles 2019. All rights reserved.